Two items came out this past week that are intimately related, although probably not intentionally linked. Foreign Policy and The Fund For Peace released their annual Index of Failed States. Africa Ia A Country calls them out, it is a failed index. We at Africa Is a Country think Foreign Policy and the Fund for Peace should either radically rethink the Failed States Index, which they publish in collaboration each year, or abandon it altogether. We just can’t take it seriously: It’s a failed index. 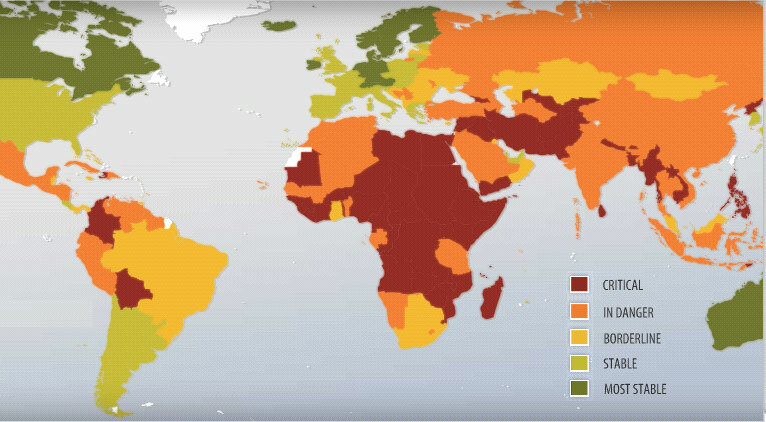 Foreign Policy’s 2012 Failed States Index, note the color key and the continent of Africa. This year, pro forma, almost the entire African continent shows up on the Failed States map in the guiltiest shade of red. The accusation is that with a handful of exceptions, African states are failing in 2012. But what does this tell us? What does it actually mean? Frankly, we have no idea. The index is so flawed in its conception, so incoherent in its structuring criteria, and so misleading in its presentation that from the perspective of those who live or work in those places condemned as failures, it’s difficult to receive the ranking as anything more than a predictable annual canard issued from Washington, D.C. against non-Western — and particularly African — nations. The problem is that there are any number of reasons why the Fund for Peace might decide that a state is failing. The Washington-based think tank has a methodology of sorts, but Foreign Policy insists on making the list accessible primarily through a series of “Postcards from Hell.” Flipping through the slide show, it’s impossible to shrug off the suspicion that the whole affair is a sloppy cocktail of cultural bigotries and liberal-democratic commonplaces — a faux-empirical sham that packs quite a nasty racialized aftertaste. How do we know if a state is failing or not? Old chestnuts like the rule of law are certainly considered, but also in play are things like economic growth, economic “success,” poverty, inequality, corruption, nonstate violence, state violence, human rights abuses, body counts, terrorism, health care, “fragility,” political dissent, social divisions, and levels of authoritarianism. And yes, we’ll be indexing all of those at once, and more. The golden principle by which this muddle is to be marshaled oh-so-objectively into a grand spectrum of state failure coefficients is apparently the idea of “stability.” But is it really? Courtesy of the Marines, ad during the Euro Cup final paid for with your taxpayer dollars, “Moving towards the sounds of chaos”. The target audience of the commercial included vast numbers of people from the majority of the world whose states the Index labels failed or failing. This is aid at gunpoint, it is also called stability operations, the reason the US Africa Command was created. The notion of stability is meant to be incoherent. It needs to be redefined for each country whose resources the US wants to acquire. Stability operations are needed to quell and control any groups or individuals who may stand in the way of perceived US interests, including acting against legally constituted governments. Military aid and questionable trade are the twin pillars of US involvement in Africa. 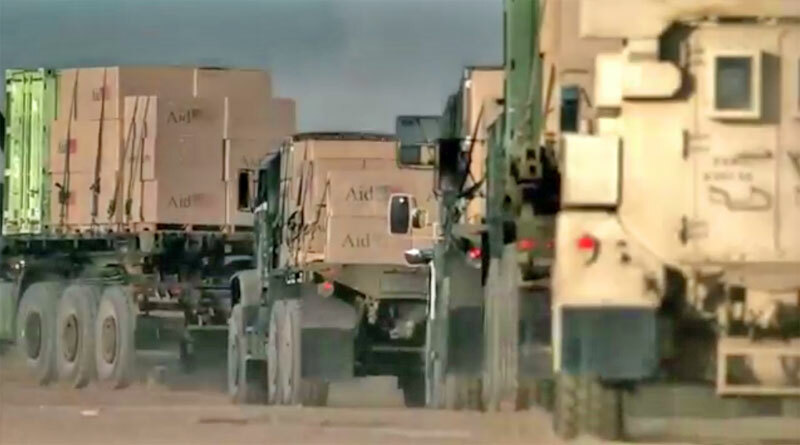 Imperial acquisition masquerades as humanitarian aid and manifests as the militarization of the continent through the US Africa Command, AFRICOM. Of course AFRICOM’s fact sheet speaks about working with military partners. These partners are intended to be proxies or surrogates that will provide stability without accountability for corporate interests to extract resources. Below are stills from the commercial. 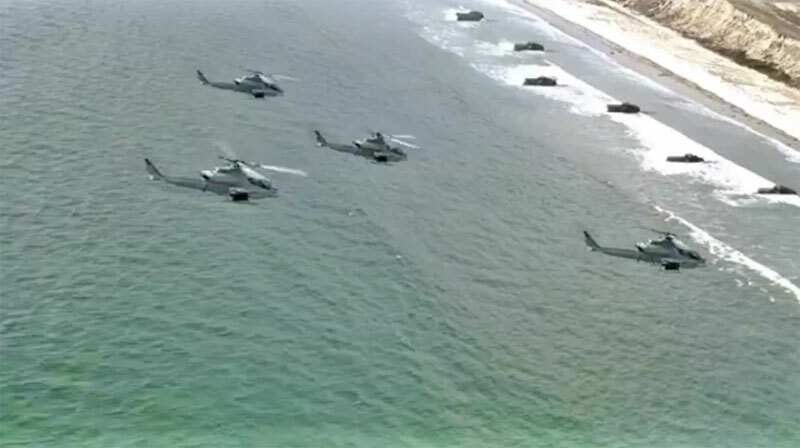 The invasion pictured is exactly what the US is training itself and its intended African proxies to do along the coasts and in the creeks of the entire continent. Polling in 2010 revealed something about US citizens’ understanding of the country’s budget. Although 1% of the federal budget is spent on foreign aid, when asked, American’s median response was to say 25% of the budget goes to foreign aid. 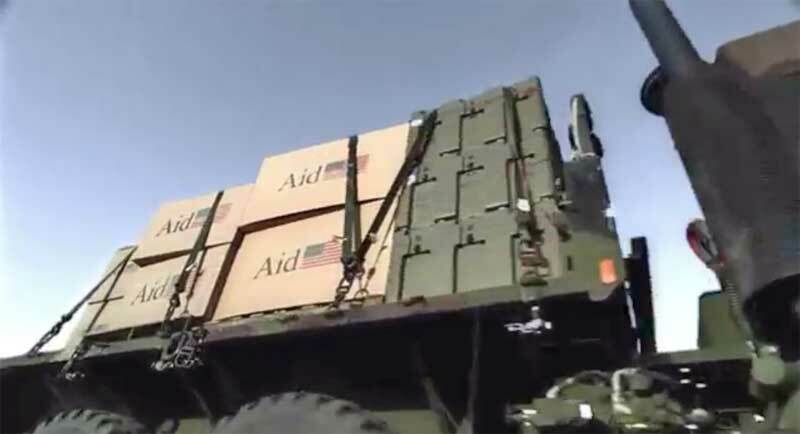 One may deduce the reason for the discrepancy between the reality and the perception of aid is that many Americans think their military activity around the world is aid. 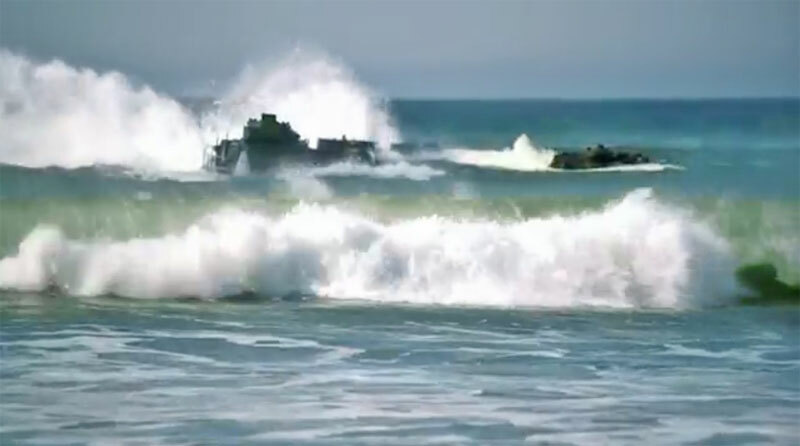 The Marines commercial is certainly intended to reinforce that view. Stability operations are intended to stabilize a country, not to make it more democratic, not to make its government more accountable, but to make it easier and more efficient for corporations to extract the resources they want from a country. Instead of being self governed, countries are subjected to military occupation with unaccountable NGOs supposedly doing the service work of government. Failed states may be more desirable to deal with than states with democratic or somewhat representative government. Those states must answer to their own people, not US or international corporations. The US has been trying to label Nigeria a failed state for more than a decade. 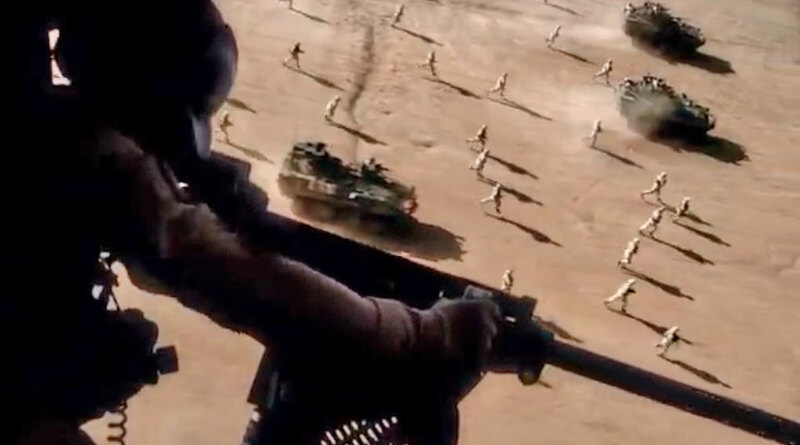 The kind of “humanitarian” invasion so vividly depicted in the commercial (although there is no blood in the commercial) is quite likely to bring, or increase, tyranny, injustice, and despair to the countries it targets. The US Africa Command puts heavy emphasis on fighting terrorism. But a terrorist may be anyone acting against US perception of its self interest, frequently those called terrorists are just political opposition. You can see this at work in the Index of Failed States. Foreign Policy explains to its readers that Malawi (No. 36 on this year’s index) is to be considered a failed state on account of the 19 people killed by police during popular protests against Bingu wa Mutharika’s government a year ago. Yet such dissent is evidence of the strength of Malawian civil society and the determination of ordinary Malawians not to get screwed by their government. Malawi is undoubtedly better off for these protests, not worse. What makes the country’s listing as a failed state look even sillier is that Malawi recently endured a blissfully peaceful transition of power following Mutharika’s sudden death, with constitutional guidelines scrupulously adhered to despite the vested interests of many of the country’s ruling class. … So how exactly can a democratic country like, say, Nigeria ever hope to satisfy the whimsical judgment of Foreign Policy magazine? The Occupy Nigeria movement that demonstrated against corruption and the removal of the country’s fuel subsidy in January was a peaceful mass movement that achieved major gains for working people. It was a thoroughly global protest, with Nigerians in the diaspora taking to the streets of Brussels, London, New York, and Washington, D.C., to demand better governance in Nigeria. Yet these protests are listed on the country’s “postcard” alongside terrorist attacks by Boko Haram as equal evidence of Nigeria’s “hellishness.” For some reason, the postcard neglects to mention the extraordinary spectacle of protesters in Nigerian cities standing guard outside each other’s places of worship — Muslims outside churches, Christians at the doors of mosques — so that each group could pray without fear of further bombings. Many of the Postcards from Hell, in fact, simply show popular protests taking place, as though dissent and social demonstrations are themselves signs of state failure. What kind of half-baked political theory is this? Maybe protests are bad for business and troublesome, but for whom exactly? And are we ranking the state or the society? Or both at once? There will never be a Postcard from Hell that bears a picture of an American street. But what if there were? What would go on there? Perhaps the picture could be of the moment last year when a police officer seized a U.C.-Berkeley college professor by the hair and flung her to the ground. One thing is certain, Foreign Policy and The Fund for Peace are enabling the lie that military intervention is humanitarian aid, particularly in resource rich Africa. They reinforce the notion that poor people are dangerous people. In doing so they are actively working against development in Africa and against the best interests of African people. They help justify the poisonously destructive picture of aid painted by the Marine Corps commercial. 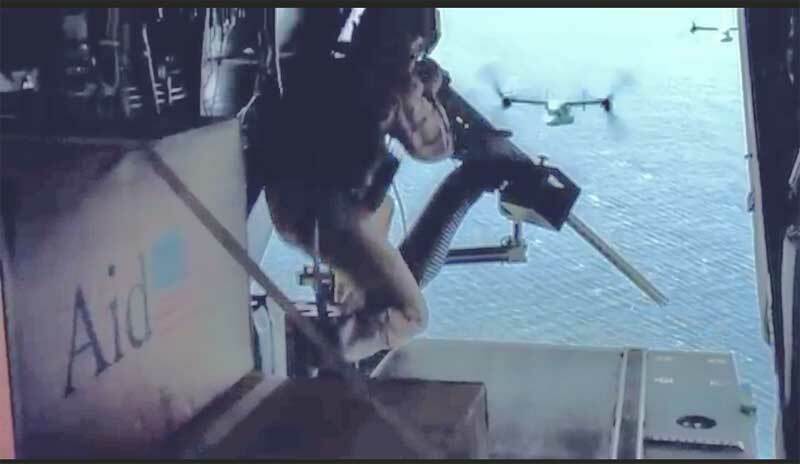 What we see in the Marine Corps ad is a Marine Air Ground Task Force. In 2010 the US Africa Command began developing MAGTF units for use in Africa. 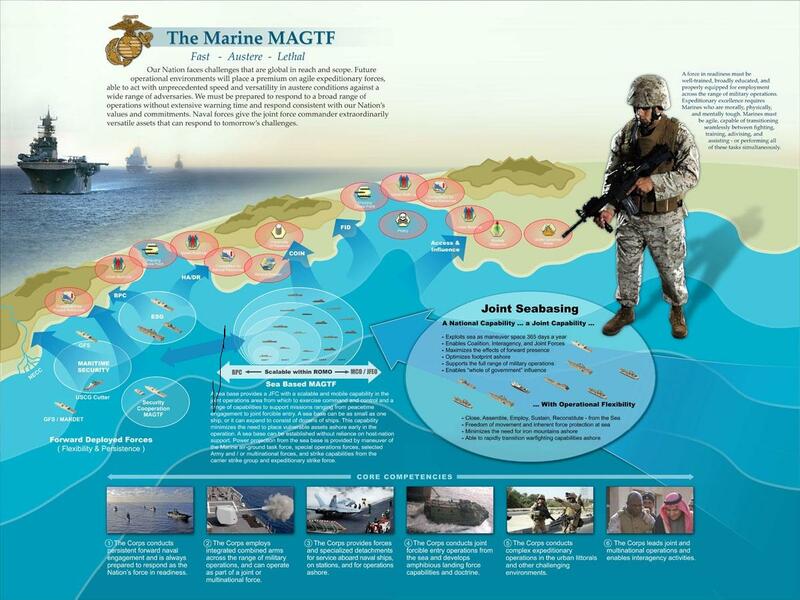 “MAGTF’s are readily available, self-sustaining, combined arms warfighting organizations,” the Marines’ Web site explains, noting among other things that such task forces are equipped to move forces into crisis areas without revealing their exact destination or intentions and project combat power at night and under adverse weather. 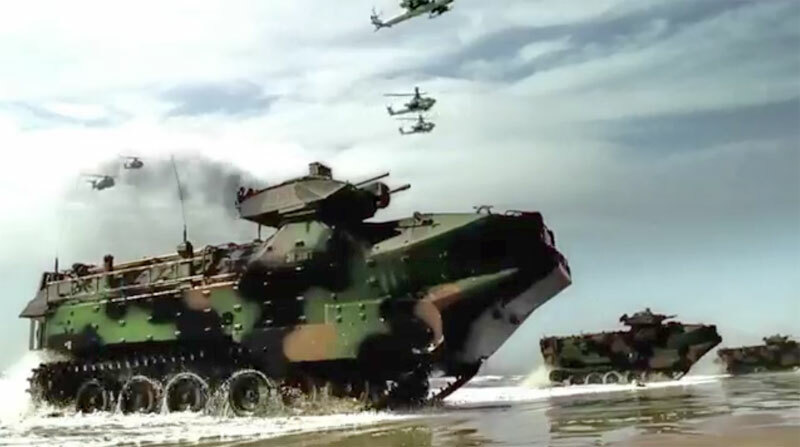 These are warfighting units designed to project US power and defend US interests. Who would need to give permission for these strike forces to strike? What would constitute a legal and appropriate use of these forces? Suppose the US government, or US based corporations do not like the policies of a certain African government? Would that government be subject to attack? Or suppose the US government or US based corporations are very happy with a particular government but that government is highly unpopular with its own people. Will the US strike against the opposition? Would it strike against political demonstrations? What would make such a strike legitimate? I can’t think of any good answers to these questions, but they must be answered, and in fact will be answered, in deed and by default, if not with diplomacy. The message the US is sending is that it feels entitled to take what it wants, wherever it wants, by force. This is the basic message of colonialism. 1) “State failure” is leading to confused policy making. For example, it is causing the military to attempt overly ambitious nation-building and development to approach counter-terrorism, under the unproven assumption that “failed states” produce terrorism. 3) “State failure” has no coherent definition. 4) The only possible meaningful definition adds nothing new to our understanding of state behavior, and is not really measurable. 5) “State failure” appeared for political reasons. You can read more explanation and detail and view diagrams tracking the term at the link. His initial tweet on the subject today still sums it up. Sunday musical interlude: Osuofia and "I Go Chop Your Dollar"